LIBRARY WINE Our first bottling from this outstanding vineyard since 2010. Opulent with aromas of mixed berries, fresh earth, anise and spice. This Pinot Noir from Rancho La Viña displays a medium garnet color, rich undertones and an appealing brightness from the pure fruit expression. Aromas of mixed berries are enhanced by hints of earth, anise and spice attributable to new French oak barrels. On the palate, flavors of black cherry and red currant are accented by hints of black peppercorn and grilled portabella mushroom. An opulent mid palate supported by velvety tannins gives way to a lingering finish with a perk of natural acidity and bright fruit. The wine will continue to grow in complexity with additional cellaring. 100% Rancho La Viña Vineyard (Sta. Rita Hills) This remarkable vineyard is located at the far western edge on the south side of the Sta. Rita Hills appellation. The 17-acre site was planted in 2005 on a gently sloped mesa, which is several hundred feet above the valley floor. The vines are fully exposed to the cool winds coming off the Pacific Ocean, making it one of the coldest Pinot Noir plantings in California. 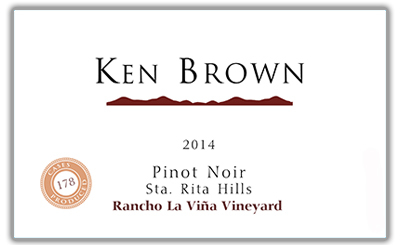 The block used for Ken Brown Wines is planted to Pinot Noir clone 115. The 2014 vintage made history as the earliest harvest on record in Santa Barbara County. It was also the shortest in duration, commencing on August 25 and concluding just 32 days later. The growing season began with a very mild winter and below average rainfall for the third year in a row. Budbreak occurred in early March followed by warm, even temperatures throughout the spring and summer. Yields were a touch above average in most vineyards, though slightly lower than 2013. Grapes from Rancho La Viña were harvested on September 1. Pinot Noir clusters from Rancho La Viña Vineyard were hand sorted before being de-stemmed and immediately chilled for a pre-fermentation cold soak where the most beneficial extraction of color, aroma and flavor occurs. During fermentation, concentration was enhanced by gently punching down the cap. As soon as the wine reached dryness, it was pressed and transferred to 60-gallon French oak barrels where it aged for 11 months. About 32% of the barrels were new French oak. The wine was bottled on August 13, 2015.